I love these sort of offers, they are such a good way to try out new items. 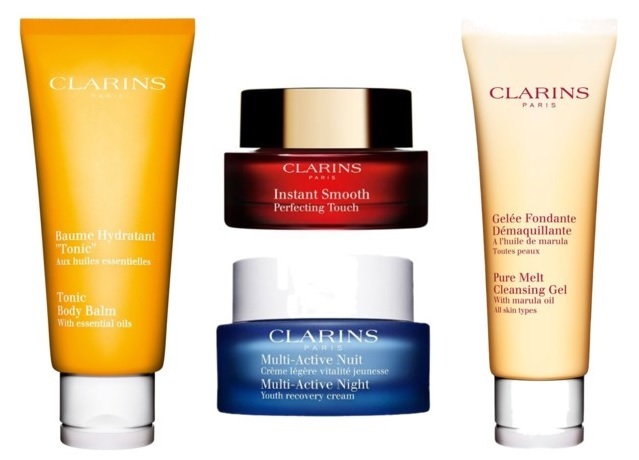 Clarins GWP items are always a really good size so it's not like you only get a few trial applications of the products. With these products you have enough to last you a good month or more in some cases and that makes me a very happy girl. I don't want a 3 day supply of something before deciding if I want to spend the full price for that product. For my free gift, I had a choice of around eight products. I was bowled over by choice and needed a little help. The lovely ladies in my local House of Fraser really are amazing and helped me chose the items that would best suit my needs. I settled on the Clarins Pure Melt Cleansing Gel 50ml, Clarins Tonic Body Balm 100ml and the Clarins Multi Active Night Youth Cream 50ml and I have been LOVING them all. I won't review them just yet as I'd like use them for a while longer and if I decide to buy the full size, which at the moment is looking very likely, especially with the cleanser and night cream, then I'll post a full review then. For the moment though, there are still a few more days to get down to House of Fraser and nab your Clarins GWP offer and don't forget, the #BeautyConfidential event also until Sept 22nd both online and in store so go grab yourself some bargains. I love offers like that, they're really good. I've never tried any Clarins products before but I have been wanting to try something from them - looking forward to reading your reviews!